George Jessel was a continual presence in showbiz during most of the Golden Age of Hollywood. A huge Broadway star, he famously turned down the lead role in The Jazz Singer, and is mostly remembered today for his officiating as Master of Ceremonies at many Hollywood and Washington D.C. gatherings, earning him the nickname "Toastmaster General of the United States." Born into a Jewish family stetting in Harlem, George was appearing in shows by age ten, helping support the family after the death of his father. His mother was a box-office tender at a vaudeville house, where she helped George form a singing trio with fellow ushers Walter Winchell and Jack Wiener. Before long, Jessel had partnered in comedy sketches with Eddie Cantor. By the age of 16, he had partnered with Lou Edwards, then went out on his own. Jessel became a well-known comic in vaudeville. He mounted his own show, "Gerge Jessel's Troubles" in 1919, and made his first silent picture The Other Man's Wife (released in June, 1919. In addition to writing his own songs, Jessel made recordings, and did bit in blackface. He was in the revue The Passing Show of 1923 on Broadway and co-produced Helen of Troy, New York, starring Helen Ford that same year. Jessel struck gold in September, 1925, by starring in The Jazz Singer on Broadway, which ran until June, 1926. Warner Bros. bought the film rights to the play and offered the lead role to Jessel, but Jessel asked for a whopping salary, as (he would later reveal) Warner's already owed him money for pictures he had done for the studio. Al Jolson was cast and the rest is history: Al Jolson became a household name, while Jessel was relegated to odd roles in small-time films. Joining up with the Tiffany-Stahl studio, Jessel starred in George Washington Cohen (released in December, 1928), then made a Jazz Singer knockoff: The Ghetto (AKA Lucky Boy, released in February, 1929). Neither film made him a houshold name. William Fox put him under contract, and starred him in Love, Live and Laugh (released in November, 1929); while he was shooting that picture, he was master of ceremonies at the "Billion Dollar Midnight Matinee" of The Hollywood Revue of 1929 onstage at the Chinese on Saturday, August 10, 1929. He presided over "Fox Studio Night." Jessel also appeared in the Fox studio's all-star musical Happy Days (released in February, 1930), and some shorts. 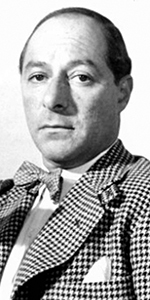 During the 1930s, Jessel returned to the stage, producing the drama This Man's Town, starring Constance Cummings, running for eight perfs on Broadway in 1930, and performing in the hit Sweet and Low in the 1930-31 season. Jessel tried to make it in radio in 1934 and 1937, but success eluded him. The Jessel name was listed as presenting the comedies Schoolhouse on the Lot in 1938, and Spring Meeting with Gladys Cooper and Aurthur Shields in the 1938-1939 season. Jessel published his first memoir, So Help Me in 1943, then appeared in Show Time on Broadway during the 1942-1943 season. He appeared as himself in the star-studded wartime films Stage Door Canteen (which played the Chinese in July, 1943), and Four Jills in a a Jeep (played the Chinese in May, 1944). During World War II, Jessel joined up with the USO and entertained troups near the front lines. Jessel also became a fixture at many Hollywood gatherings, becoming a popular toastmaster. In 1946, he became a founding member of the Friars Club. After the war, Jessel became a producer at 20th Century-Fox, producing films like: The Dolly Sisters with Betty Grable (which played the Chinese in February, 1946), Do You Love Me with Maureen O'Hara (which played in May, 1946), I Wonder Who's Kissing Her Now with June Haver (which played in July, 1947), Nightmare Alley with Tyrone Power (played the Chinese in November, 1947), and When My Baby Smiles at Me with Betty Grable (played the Chinese in November, 1948). 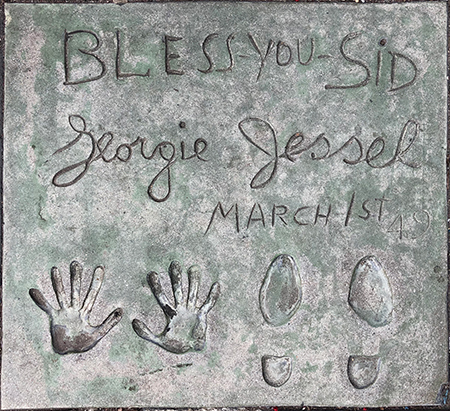 Jessel was probably working on Oh, You Beautiful Doll with June Haver (which would play the Chinese in November, 1949), when Sid Grauman asked Jessel to come and make his imprints in the Forecourt. Jessel had just released his new film — Dancing in the Dark with William Powell — which had come out and played the Chinese in February, 1950, when Sid Grauman passed away in March, 1950. Jessel gave the eulogy at Grauman's funeral at Forest Lawn, Glendale, where he spoke of Grauman as being "the soft touch and the soft heart of Hollywood." Jessel's string of Fox pictures continued with Meet Me After the Show with Betty Grable (played the Chinese in August, 1951), Anne of the Indies with Jean Peters (played the Chinese in November, 1951), Golden Girl with Mitzi Gaynor (played the Chinese in November, 1951), and Wait Until the Sun Shines, Nellie with David Wayne (which played the Chinese in July, 1952). Just to keep it interesting, Jessel made a personal appearance on stage at the Chinese on opening night of Wait, Wednesday, July 2, 1952 at 8:15, before rushing off to plug the movie at other day-and-date theatres in Los Angeles. The last films Jessel produced for Fox were: Bloodhounds of Broadway with Mitzi Gaynor (played the Chinese in November, 1952), The I Don't Care Girl with Mitzi Gaynor, with Jessel playing the producer of the picture onscreen (played the Chinese in January, 1953), and Tonight We Sing with a cast led by David Wayne (released in January, 1953). Jessel hosted the television program The George Jessel Show, over ABC, from September, 1953 to April, 1954. During the rest of the 1950s and into the 1960s, Jessel guest starred on literally hundreds of television programs. Jessel published his second memoir, This Way, Miss in 1955. Jessel continued to take small "MC-ish" roles in films like The Busy Body with Sid Caesar and Anne Baxter (released in March, 1967), Valley of the Dolls (which played the Chinese in December, 1967), Can Heironymus Merkin Ever Foget Mercy Humppe and Find True Happiness? with Anthony Newley (released in March, 1969), The Phynx (released in May, 1970), and Won Ton Ton, the Dog Who Saved Hollywood (Jessel plays an announcer at a Hollywood premiere filmed in the Forecourt of the Chinese, and which was released in May, 1976). Jessel published his third memoir, The World I Lived In in 1975, and was filmed as one of the "witnesses" in Warren Beatty's film Reds (which played the Chinese in December, 1981). Jessel had died of a heart attack while at the Medical Center at UCLA in May, 1981, at the age of 83. Grauman's Chinese Theatre, Hollywood, California. George Jessel Forecourt ceremony, Tuesday, March 1, 1949. 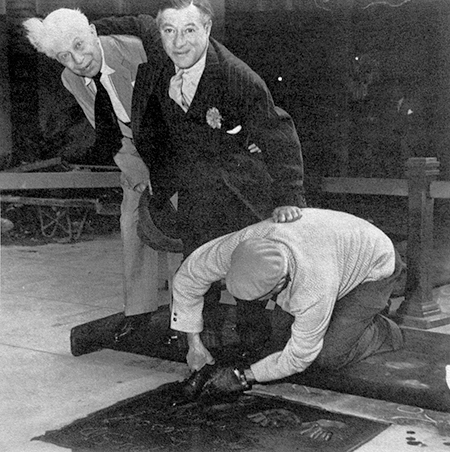 Sid Grauman shows an interest as George Jessel makes his footprint with the assistance of cement artist Jean Klossner.